Business owners in 2019 likely know they need a website. Even if you’re a two-man operation, you’re not in sales, per say, or you only cater to locals, you still need a virtual storefront to bolster the success of your business’s physical location. Having a website means exposure to a broader pool of potential customers or clients; it helps you establish credibility in your field, and people trust businesses with an online presence other than a Facebook page and a Yelp listing. The follow-up to that tip is the often understated importance of keeping your website online consistently once you’ve built it. While your brick-and-mortar may have routine 9-to-5 hours of operation, your virtual store is open for business 24 hours a day, seven days a week, 365 days a year — or it should be. Anything short of 100% not only means a drop in traffic but revenue loss as well. You wouldn’t randomly close your doors during peak business hours, would you? Downtime costs you, so web hosting providers offer uptime guarantees to assure you of their service and reliability. Let’s take a look at some of the best rates out there and who offers them. First we have the Holy Grail of uptime guarantees: the 100% availability promise. Only a small faction of web hosting providers will vow to keep your site online at all times or pay the price. This uptime guarantee is almost exclusively limited to dedicated, cloud, and virtual server plans, so you’ll notice price points and resources that match the high reliability. Shared hosting customers typically do just fine with a 99.9% or 99.99% uptime guarantee. Hosts with 100% uptime guarantees have staff constantly monitoring servers housed in redundant datacenter locations. It’s worth noting the 100% uptime may not include scheduled downtime for maintenance, or there could be other caveats. Even the most reliable hosts may only make this pledge on certain plans, and most providers can only pull it off with strategic datacenter locations. Leveraging East and West Coast datacenter locations, redundant cooling features, emergency generators, and round-the-clock monitoring, the DreamHost team has spared no expense to maximize the availability of their servers. The company’s commitment to customizable hardware configurations and furthering open-source innovation is highly respected in the industry, and the 100% uptime guarantee for dedicated hosting is appreciated by customers around the world. For every hour of downtime your site experiences (apart from scheduled maintenance), DreamHost will compensate you the cost of one day’s worth of hosting expenses — putting company money where their marketing mouth is, to say the least. One of our favorite hosts to recommend for service and support, Liquid Web delivers best-in-class hardware, expert support, and round-the-clock availability monitoring to back the 100% network uptime guarantee. Few hosts have the means to offer such a promise. Liquid Web’s infrastructure offers custom confirmations, robust security, and meticulous backups conducted by the team. The company’s relentless efforts to keep your site(s) online are reflected in the host’s consistently exceptional Net Promoter Score (NPS), which translates to the likelihood of a customer recommending the services to a friend. And here we have the rate hosting experts say to strive for — “five nines or better,” as folks often say. This supreme uptime rate slices the aforementioned downtime rates in half — 30 times over. Few hosts have the chutzpah or the physical infrastructure capacity to pledge this level of availability, but it is most commonly found in dedicated and virtual server plans. InMotion is known for its market-leading hardware, performance-enhancing SSD storage, and ultra-reliable expert support. The host’s dedicated servers come with the added benefit of an industry-leading uptime guarantee. The company assures 99.99% uptime across all hosting plans, and dedicated server customers enjoy 99.999% net uptime, thanks to the redundant-switching network design of InMotion’s Smart Routing™ technology. An innovator in the cloud hosting space, a leader in premium managed server hosting, and the standard to which hosting customer service is set, Media Temple embodies reliability to the highest degree. The 99.999% uptime guarantee is just the beginning. MT touts redundant, blazing-fast SSD servers for top-of-the-line performance, and the team conducts regular malware scanning and network monitoring for premiere security. The price point might take your breath away at first, but you’re getting those five nines the industry is always talking about. This is a host worth considering if you’re serious about availability. Pushing the hosting industry status quo for reliability are the hosts with 99.99% uptime rate guarantees. These providers assure their customers’ sites will experience no more than about a minute of downtime in a seven-day time span, or a hair over four minutes in a 30-day stretch. Hosts with these guarantees are few and far between, as most either stick with the status quo or go all in on high availability (with five nines or better). A long-time legacy in the domain, email, and web hosting spaces, 1&1 brings premium reliability at an accessible price point. Even modest shared hosting plans benefit from the company’s 99.99% uptime guarantee, and all packages include a complimentary content delivery network (CDN) and protection against DDoS attacks. Network Solutions, or NetSol, is a member of the Endurance International Group (EIG), parent company to some of the most well-known names in web hosting, including iPage and Bluehost. Network Solutions is one of the few EIG brands to guarantee 99.99% uptime to its customers, and NetSol users enjoy 24/7 expert support and a 30-day money-back guarantee. Any host worth its salt is going to offer a minimum uptime guarantee of 99.9%. Anything less is hardly a promise to be proud of, and most of the top shared hosts boast 99.9% uptime rates. This equates to roughly 10 minutes of downtime each week or about 43 minutes in 30 days. Having personally toured one of InMotion Hosting’s datacenter facilities in Los Angeles, I can personally attest to the efforts this team puts into ensuring reliability for their customers. Boasting a 99.9% uptime guarantee, InMotion will transfer your site to its servers for free with no downtime during the migration. The company leverages East and West Coast datacenter locations to stifle the impact of routine maintenance, as well as unexpected power outages. If you’re a current InMotion customer, you can monitor InMotion’s network status here. Bluehost is a staple in shared web hosting, carrying the 99.9% uptime rate guarantee customers expect from popular hosts. While Bluehost promises to try to resolve any issues within 15 minutes, extreme server pains may take longer to relieve. Nevertheless, the host is a trusted partner for millions of individuals, small business owners, and enterprise professionals. The hosting company is endorsed by the WordPress.org team, offers round-the-clock expert support, and is routinely recognized by the shared hosting community. HostGator holds a reputation for helping hosting customers grow from shared to dedicated server users. As you scale your website and/or business, the HostGator team applies an all-hands-on-deck approach to service. The 99.9% standard uptime rate, coupled with year-round, 24/7 US-based support, makes this host a favorite as far as reliable web hosting services go. Bringing it back to the basics, uptime is the amount of time your website is online and accessible to the public. Naturally, you want this rate as close to 100% as possible. As such, hosting providers often offer an uptime guarantee to distinguish their service from that of competitors. An uptime guarantee is your web host’s assurance your site will be online a certain percentage of a year. You can calculate how much cumulative downtime to expect for your site given a certain uptime rate, or see the highlights below. It’s generally understood that 99.9% uptime is a hosting industry standard, whereas five nines or better (99.999% and up) is the ideal. 99.9% uptime means your website may be down for a total of eight hours, 45 minutes, and 57 seconds each year. 99.99% uptime means your website may be down for a total of 52 minutes and 35.7 seconds each year. 99.999% uptime means your website may be down for a total of five minutes and 15.6 seconds each year. Some hosts offer a service-level agreement (SLA) with their promise of availability. In short, an SLA commits the host to a refund should a customer experience downtime in excess of the uptime guarantee. An SLA typically defines a minimum outage period to give the host time to detect the error, and then a host may credit you a certain percentage of your monthly fees for a month in which you experience more downtime than normal. 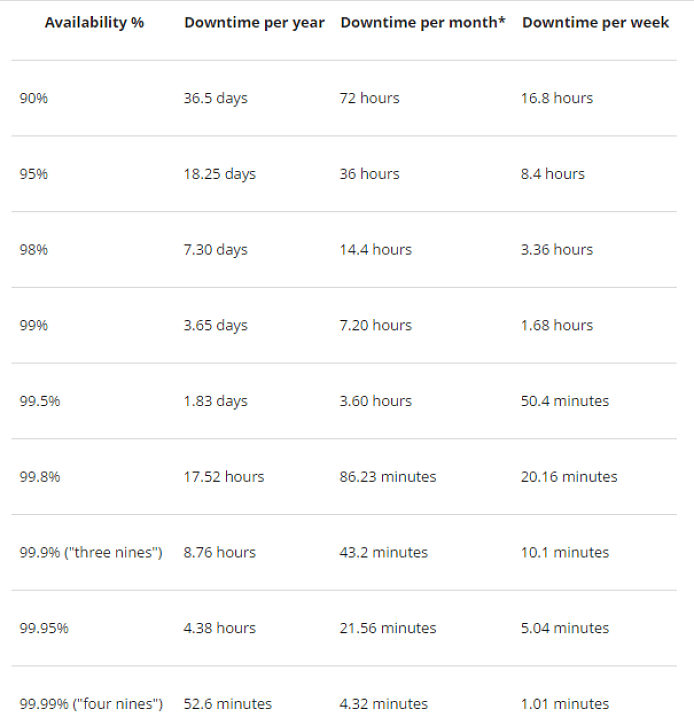 While 90% downtime is fair, 99.9% is the hosting industry standard, and 99.999% uptime is exceptional! You can download a free example of a host SLA here. Just as the owner of a much-loved local brunch spot wouldn’t abruptly lock the doors at 10 a.m. on a Sunday — denying paying customers access to Bloody Marys and hash browns — you can’t afford for your online store or professional site to go down. Consider your web host a silent partner in your business. The team keeps the lights on and helps ensure things are running smoothly, but the brand is yours to foster and grow. Review servers and plans from the most reliable hosts of 2019 for more of the best uptime guarantees to get started! How Does JustHost Compare With the Top WordPress Hosts?